When researching bakeries for our office dinner, my assistant came across San Diego Desserts on 60th and El Cajon Boulevard. What intrigued us even more was that Bistro Sixty is an extension of San Diego Desserts. 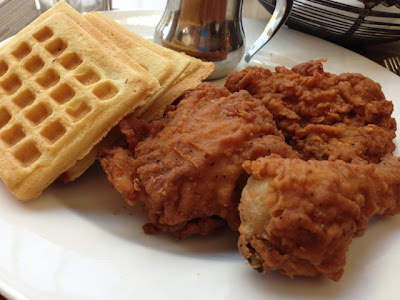 The food photography on Bistro Sixty's website is amazing so I knew I had to visit. I met my good friend/college roomie, P, here for lunch on a Thursday. 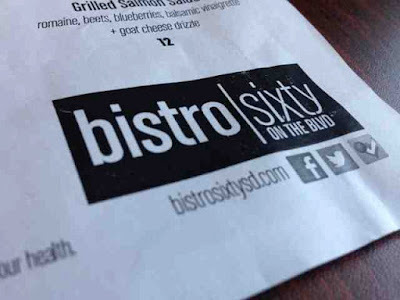 Bistro Sixty opens at 11:00am for lunch. I arrived before P did at 11:30am and I was the only guest there. Parking was convenient; right on the street in front of the restaurant/bakery. 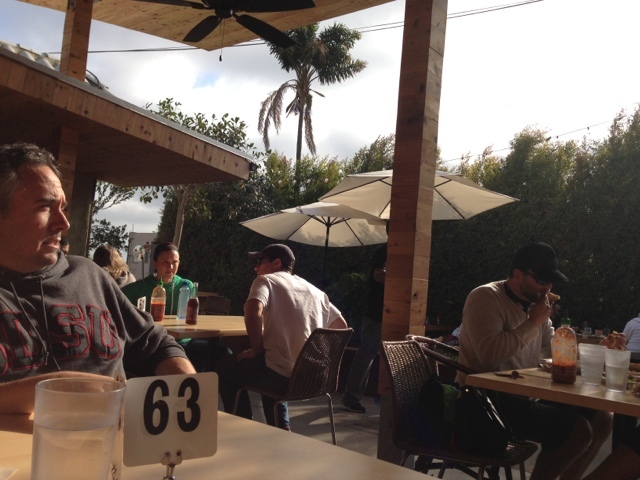 I had the option to sit anywhere so I picked the outside patio, which clearly was the new addition to the bakery. 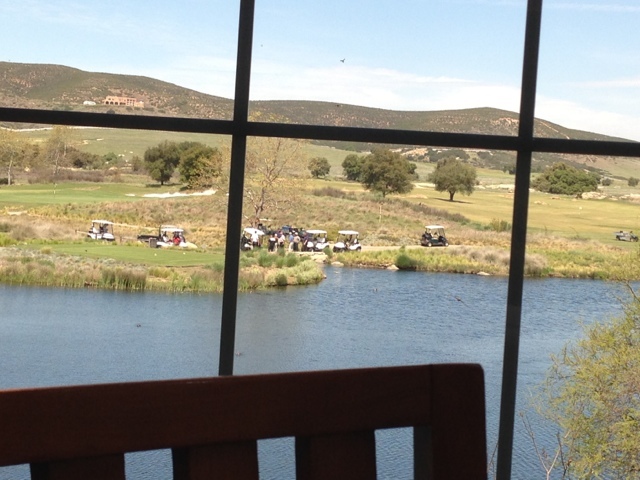 This was my view from the table... looking at the inside of the bakery. To the left of where I was sitting was a stage. My server told me that it gets pretty packed in the evenings, especially when they have live music. I browsed through the menu as I waited for P. The prices are very, very reasonable. 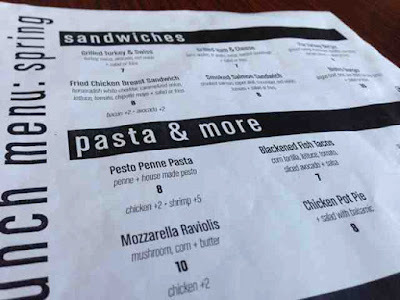 The entrees are all $10 or less and they come with either french fries or a side salad. 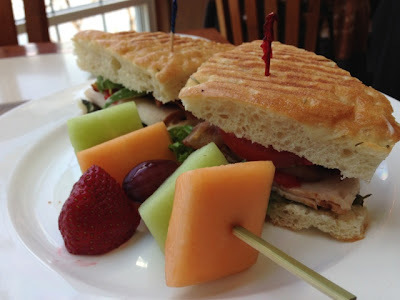 For lunch, sandwiches, pasta, salads and quiche are served.. very simple. Because the bistro is also a dessert place, I wanted to try the chicken pot pie for a good, flaky, buttery crust. I had a feeling that it would be awesome because of that fact. 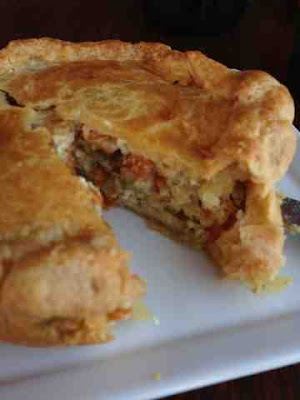 I love quiche too, but it wasn't speaking to me that day. 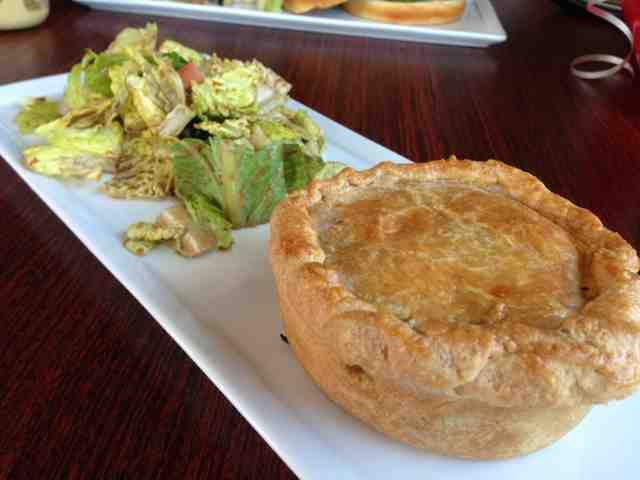 I ordered the chicken pot pie ($8.00) with a side salad. The pie was petite and very cute. The outside was perfectly baked. The salad consisted of romaine hearts, chopped tomatoes, sliced cucumbers, and dressed in a balsamic vinaigrette. It was simple and fresh. The crust of the pie was perfect. It was buttery and flaky. The pie filling had chicken, tomatoes, celery, and spices -- it was so delicious! My friend ordered the turkey burger ($9.00) with a side salad. 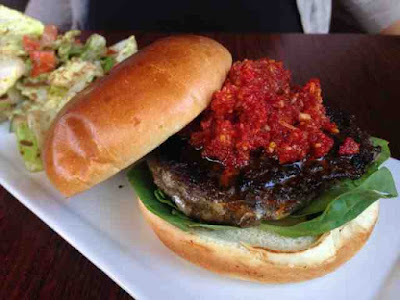 The turkey burger is a mixture of ground turkey and mushroom duxelle -- genius! Seriously, we all know that ground turkey can be dry and if it is not seasoned correctly, can be flavorless... but this patty was SO GOOD. I was a bit jealous of her dish. 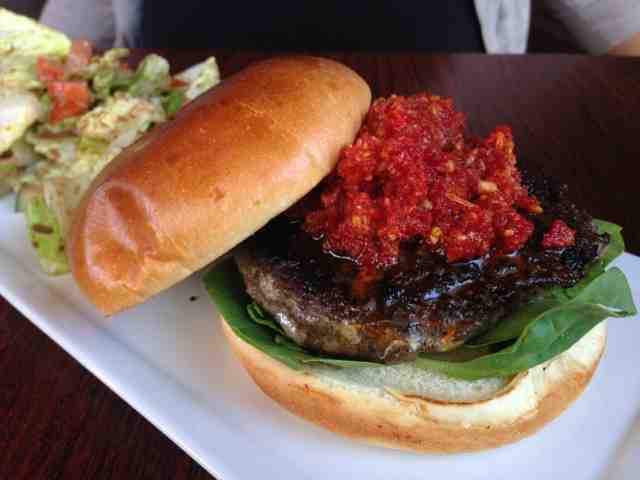 The addition of the sun dried tomato pesto made it even more flavorful. 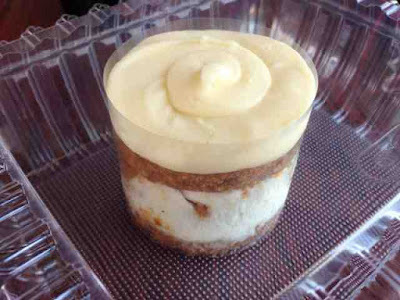 I could not leave the place without ordering a dessert so I browsed through the dessert case inside the restaurant and chose my favorite.... carrot cake ($5.25). Our server put it in a plastic container, like so, and the entire cake was protected by a plastic rim since there were three lovely layers of cake here. I was excited to share it with the office. The cake moved around in the car so by the time I opened it in the office, it moved to the corner of the plastic container. Haha. This is a view of the cake with the plastic rim removed. 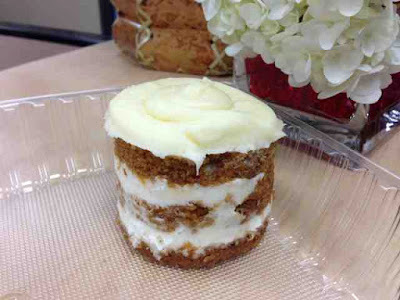 ﻿The cake was very sweet in flavor because of decadent cream cheese frosting. It was heavenly. 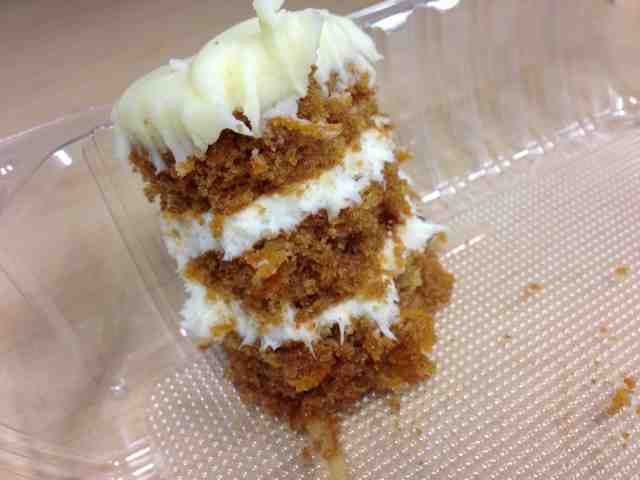 I absolutely love carrot cake and I always want to try it anywhere that serves it. This version did not have nuts or raisins. 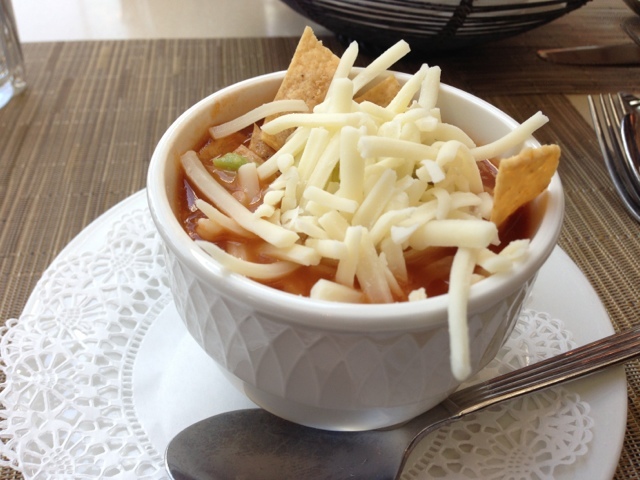 It was cute and a perfect finish to a nice lunch at a new place. Thumbs up for me! All in all, I am happy to have found a new lunch spot. 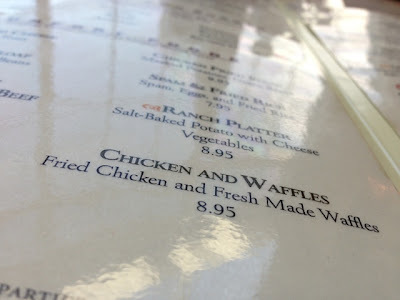 I really, REALLY want to go back for the turkey burger. An older gentleman inside ordered french fries with his sandwich and they looked crispy and delicious too. Yeah, definitely... I will be back! FINALLY. I *finally* physically made it to Carnitas' Snack Shack. After having their wonderfully braised pork belly app that I received as a to-go treat from my friend, I just had to visit the land of 'everything pork.' 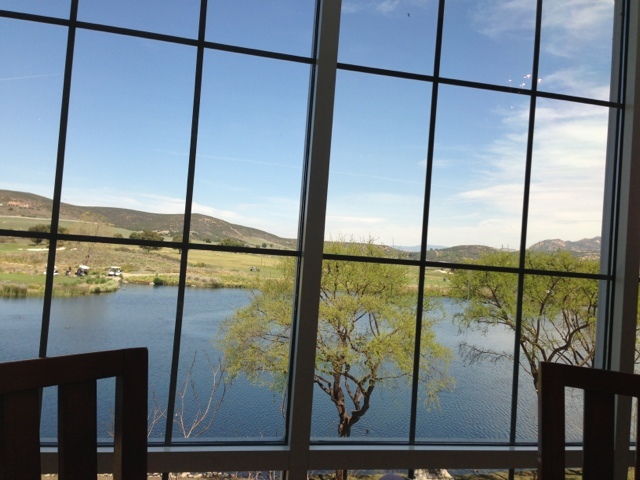 I visited with my good friends, J and J, for an early dinner on a Saturday evening. 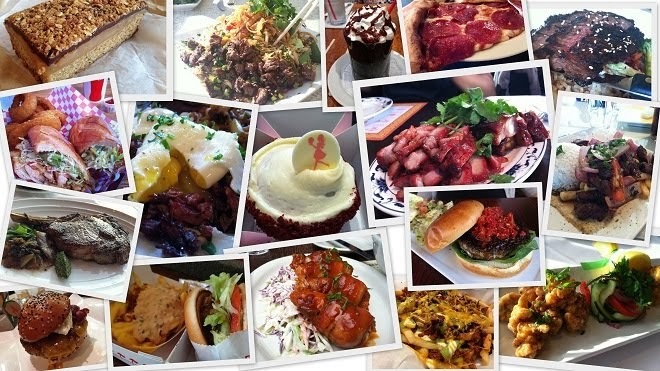 When deciding what I should order, I had an inner debate with myself whether to order the pork belly app again (because it's SO delicious), trying something on their regular menu, OR trying one of their menu specials (something they do not serve every day). I ordered my dinner with a bottled soda. 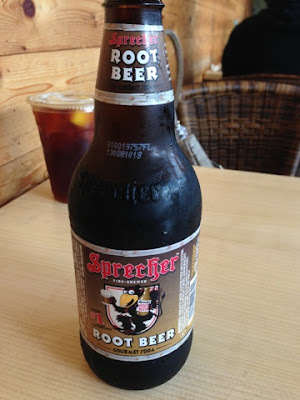 Carnitas Snack Shack does not have fountain sodas; instead they carry cool bottles of soda, like the Sprecher Gourmet Soda I ordered (root beer), Coca-Cola bottles, and bottled beers. 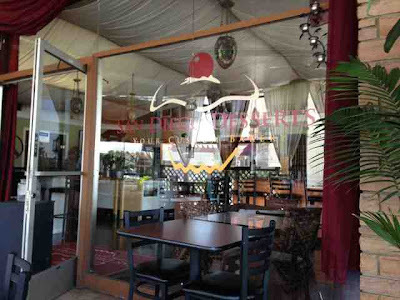 They do offer fresh brewed iced tea (you can see one in the background) and complimentary water in the seating area. I have loved root beer every since I can remember. 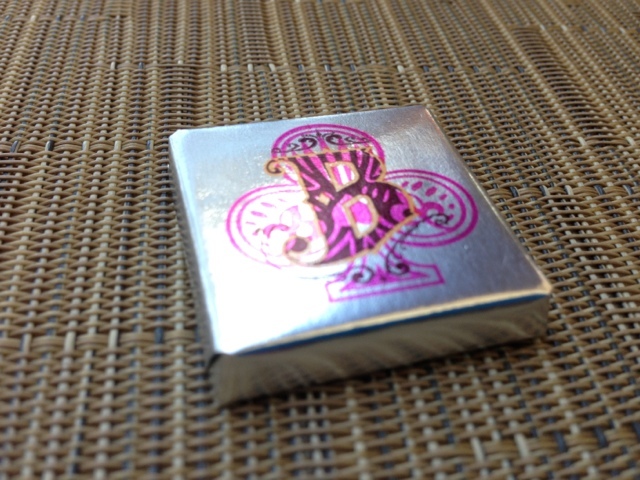 The taste was bold, frosty and sweet. I loved every sip of it. 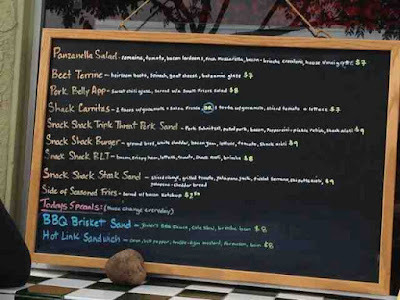 I ordered one of the menu specials.... BBQ brisket sandwich ($8.00). 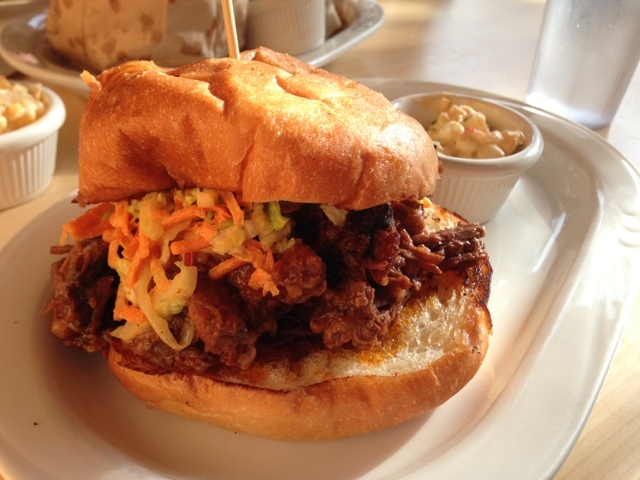 Here are my reasons: #1) I love BBQ brisket and since I don't see it in enough menus here in San Diego, I order it. #2) I love beef. 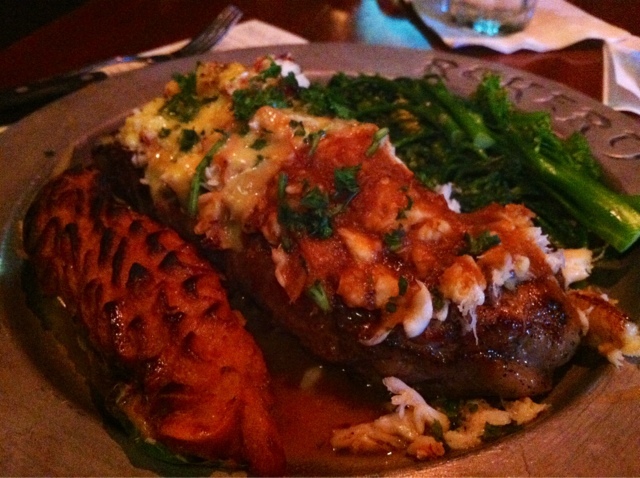 The hubby doesn't eat beef anymore so we don't have it at home... so, beef is pretty much what I order at restaurants. And, lastly... #3) it's a menu special. I can come back to Carnitas and try their pork sandwich anytime but it may be rare to see their brisket on the menu again. The brisket was moist and amazing. It had enough spice but it was not "spicy". 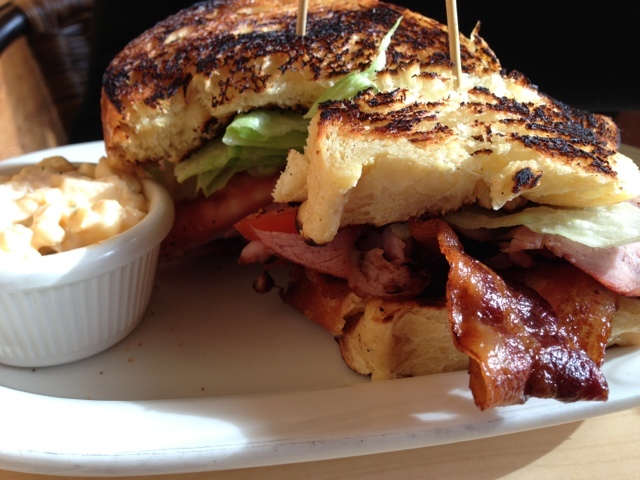 The brioche bun was nice and soft, and it still held the sandwich very well. 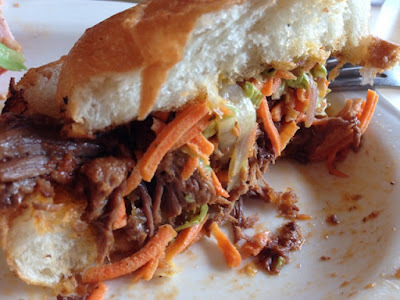 The coleslaw was primary made up of shredded carrots, but I loved the crunch and how the slaw toned down the overall robust flavor of the meat. 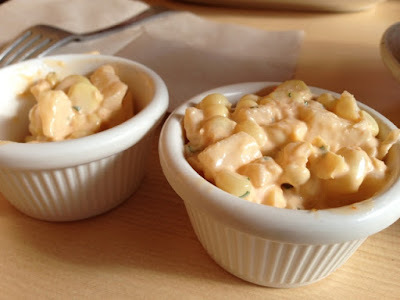 Every dish comes with their corn relish. It was creamy, crunchy and delicious. J and J gave me theirs so I had three to eat. I only made through two of them. I am guessing that extra crunch is diced jicama they put in the corn salad. Does anyone know? 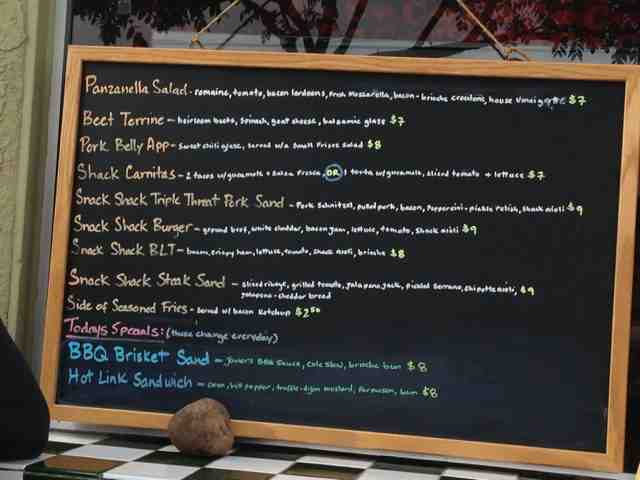 Both J and J ordered the Snack Shack BLT ($8.00). What can I say? Bacon, bacon, BACON. They gave me some of their bacon. J told me, "You're never going back to turkey bacon after eating this." I could have eaten a basket of that bacon. 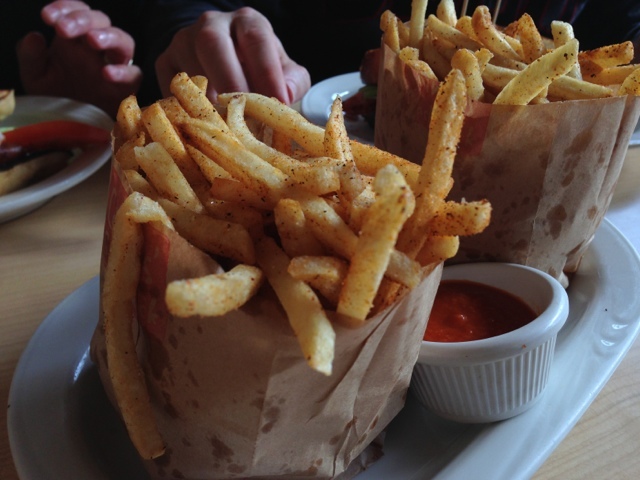 We split two orders of the seasoned fries ($2.50). The fries were really seasoned well. The homemade ketchup was sweet and good. 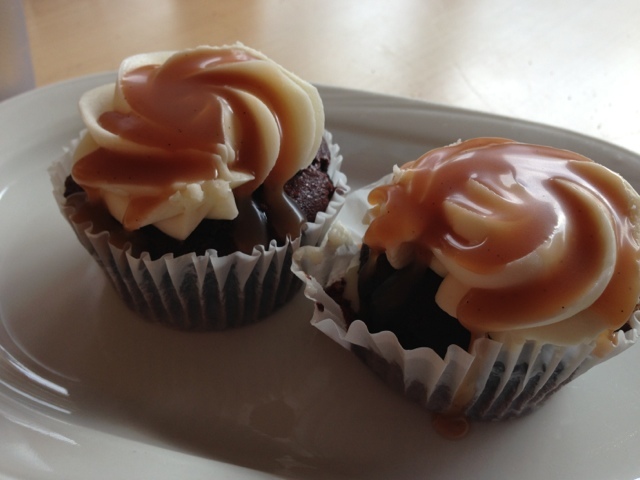 For dessert, we shared the caramel chocolate cupcakes (2 for $5.00). They were tiny in size but they satisfied the palate after a savory dinner. The cake was chocolately and moist, surprisingly not too sweet. The sweetness, of course, came from the gooey caramel and the vanilla frosting. 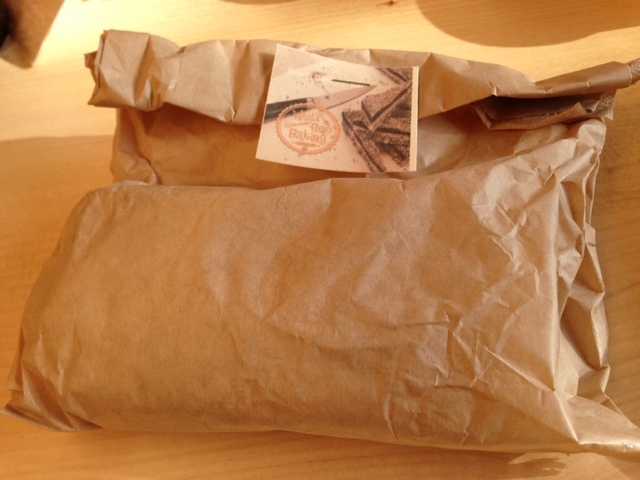 I could not wait to see what goodness was inside this paper bag o' yummy. Ta-da! The bacon crunch bar ($5.00) was the finale. 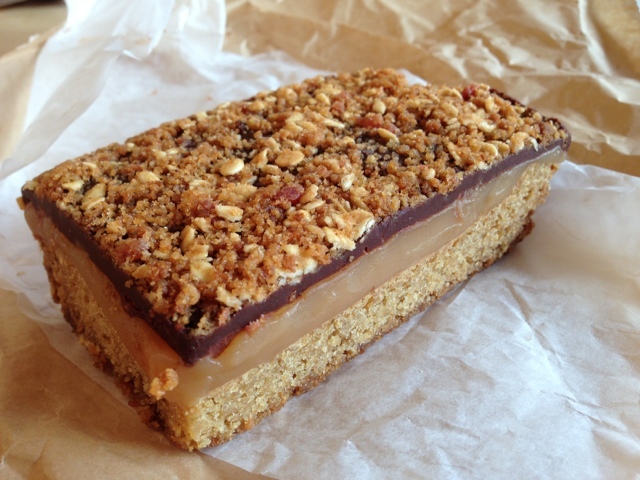 Bacon bits, chocolate, caramel layers on a rectangular cookie. It was really, really good. At the first bite, my palate said, "Wow, SWEET"... then as I kept eating, the savoriness of the bacon hit me at the end. This was awesome! The Carnitas' Snack Shack experience definitely lives up to the hype. Their food is delicious and the menu is small and simple. I saw on Instagram that the Travel Channel was there with Troy Johnson recently. I predict longer lines in the future! Date night in Phoenix means delicious food at a new restaurant. 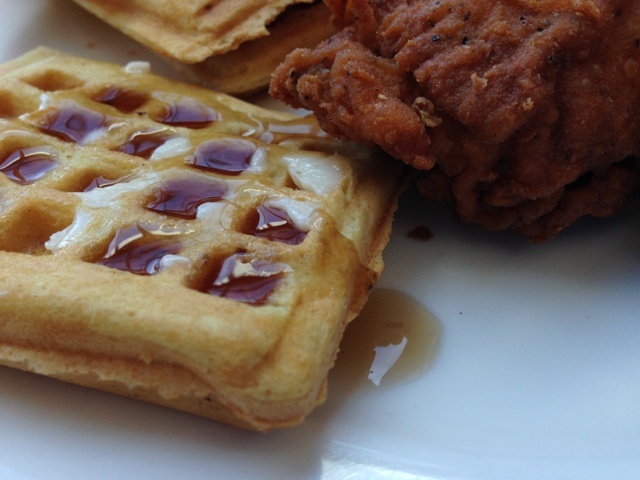 Phoenix is a city full of so many "non-chain" restaurants, like Rokerij. 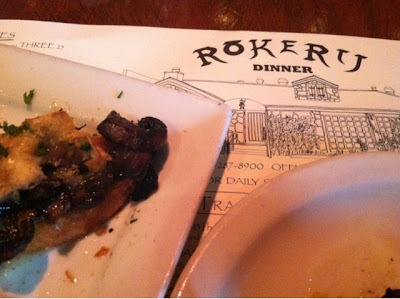 The hubby's parents had recently went to Rokerij and loved it. 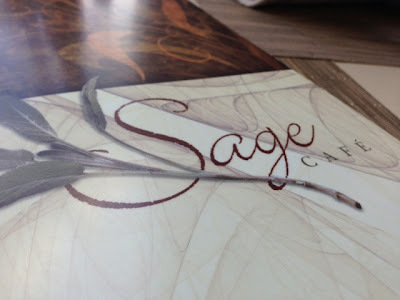 We followed in their footsteps and went there for an early dinner for date night. 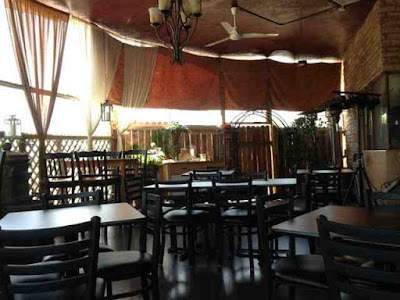 Rokerij is one of three restaurants in the Richardson's of New Mexico restaurant group. The 'J' is silent in the restaurant name and it's pronounced "row-ker-ree," meaning 'smokehouse'. Looking at all three menus, they all offer the same type of New Mexican type of cuisine -- a combination of Mexican, Tex-Mex, and "Cowboy Chuckwagon". We started off with the mushroom toast ($9.00) based off the rec from the in-laws. 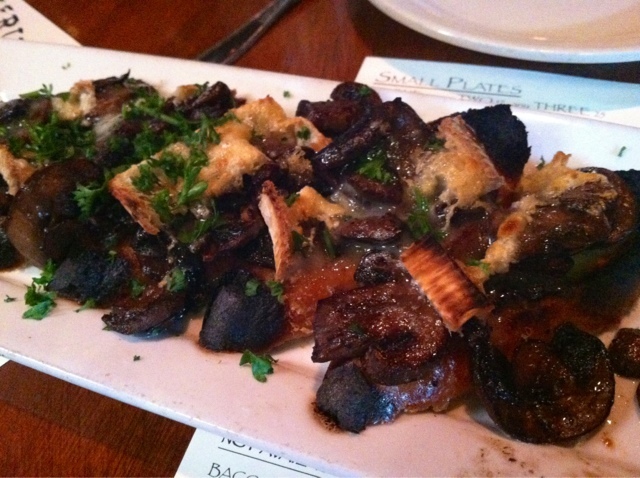 They were crostini topped with sauteed button mushrooms and French brie cheese. The tips of the crostini were burned, which was very disappointing. Boo on the kitchen! Once we got passed the burned part, the toast was really good - savory, creamy and delicious. We both ordered the Caesar salad ($10.00). 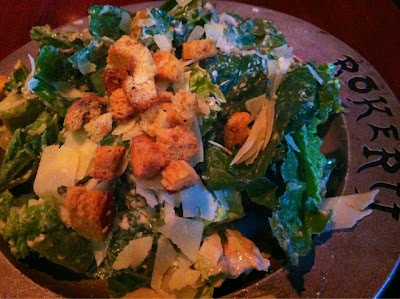 It was a standard Caesar - romaine lettuce, shaved parmesan, and croutons - on a cool, chilled medieval looking plate. For my entree, I chose one of specials on written on the chalkboard: the Rokerij New York strip ($38.00). Are you ready for this combination? 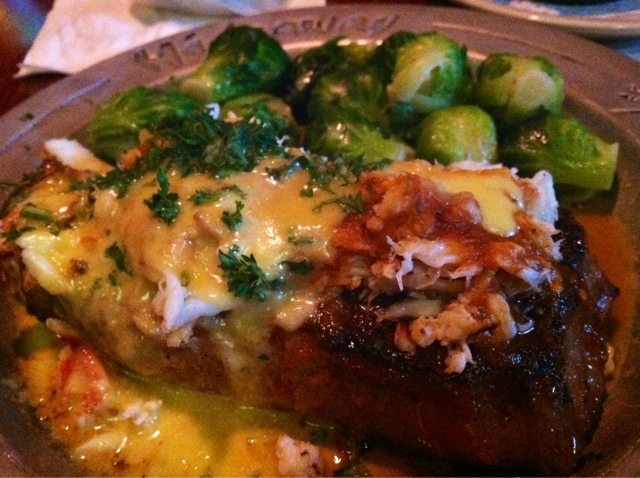 It is a grilled New York strip steak topped with dungeness crab, jalapeno hollandaise, and a spicy hot sauce. Talk about rich and succulent! The steak was cooked to perfection and the flavors of the sweet crab and rich hollandaise was such a treat for my tummy. It was really delicious. For my two side dishes, I chose the "lighter" sauteed brussel sprouts and the mashed potatoes. Again, the top of my mashed potatoes (in this cute cast iron skillet) was slightly burned. 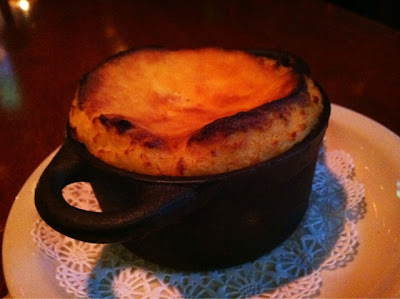 And, again... once I got passed the burned portion, the mashed potatoes were okay. Not as creamy, as I would have liked it, but it was good. The hubby and I always joke around that we always order the same thing because we like the same flavors. We really do; and we don't take the time to think of a plan of how we will share different items for more flavors. We just want what we want! Then, after we are full, we always laugh how we should have split the same item and get something else. With that said, the hubby ordered the Rokerij New York steak too, but with their signature mashed potatoes in a green chile and sauteed broccoli rabe. Between the mushroom toast, salad and our humongous entrees -- we definitely ordered way too much, but we left with our tummies happy AND a doggy bag. We are unsure if we will be back to Rokerij, but we are glad to have had the experience.